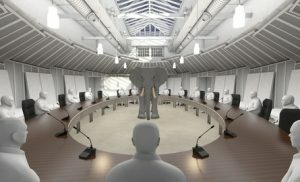 The Elephant in the Room: Is it inevitable that the “DB Pension Promise” will be broken? Posted 28th September 2016 & filed under Blog, Intergenerational Justice, Pensions. Is it inevitable that the DB “Pension Promise” will be broken? serve just about any other useful purpose that one could dream of funding with £35bn a year. Throughout the 1990s and early 2000s, as DB pensions became increasingly expensive in the face of falling interest rates, equity market crashes and increasing life expectancies, companies began to close their DB schemes to new entrants. In 2015, only two FTSE 100 employers maintained a DB plan that was open to new employees. The majority of employers had boarded-up their DB plans before the millennial generation entered the workplace and, as a result, the demographics of DB pension plan members are firmly skewed to the oldest generation of UK workers. Contrast this with the demographics of today’s workforce: in the US, “Millennials” have recently overtaken their “Generation X” and “Baby Boomer” colleagues as the largest proportion of the working population. Comparable statistics are patchy for the UK, but it would be reasonable to assume a similar proportion. As always, firms remain under pressure to improve profitability, but in the current climate of stagnant growth it is increasingly difficult to achieve this through top-line revenue – so firms look to cut costs. For a service-led economy such as the UK, the largest expense for a firm is often staff, so this is where cost-cutting falls heaviest – whether through redundancies, depressed wages/wage growth or lower investment in training and development. These downward pressures are falling disproportionately on the young. The trillion-dollar question: how much longer is this position sustainable? So is it realistic that, in the near future, as millennials make up an increasing proportion of the workforce and become the decision-makers and policy-makers of tomorrow, they will serve as the future-generational “greater fools” and continue to fund DB deficits to their own detriment? I don’t think anyone would deny that the current pension funding situation is strained, and that the problem is partly exacerbated by the fact that decisions are made by people who stand to benefit from maintaining the status quo: policy-makers, trustees who make decisions on the behalf of pension scheme members, and company executives responsible for funding the DB plans often stand to receive generous DB pensions. We’re letting the fox design the chicken coop. And let’s be clear – this problem is unlikely to resolve itself. An increasing number of economic commentators expect interest rates to remain lower for longer, especially following the Bank of England’s decision to cut rates following the EU referendum. The other key variable in the liability valuation, life expectancy, is likely to keep increasing as people become more educated in exercise and nutrition and the medical profession continues to find ways to keep us alive for longer. So this funding problem is likely here to stay – the only way to stop the problem ballooning even further is to reduce the scale of promised benefits in one way or another. I’m sure some people will read this and declare sacrilege: a promise is a promise – it cannot be broken. I think everyone wants to see people enjoy their well-earned retirement years as comfortably as possible, but we must ask: at what cost? One thing is for certain – the sooner the topic is approached with a pragmatic perspective, the better informed and prepared everyone involved will be. If we continue to ignore the elephant in the room until it sits on our lap, the fallout will be that much worse.